Vanberg sjunger med stor inlevelse, utan noter och med blicken ute i publiken. Efter Comfort ye kommer två snabba arior ur Ariodante och Il Trionfo del Tempo e del Disinganno, båda kraftfulla och med långa, skickligt utförda koloraturlinjer. Men högst klingar nog ändå de långsamma ariorna efter paus, Un momento di contento ur Alcina och Waft her, angels ur Jephta, vilka inte lämnar någon i publiken oberörd. Podczas finału wystąpili także świetni soliści. Tenor Martin Vanberg zachwycał swobodą śpiewu i barwą głosu. "In the final concert were excellent performances among the soloists. Tenor Martin Vanberg was delightful with a free voice and wonderful timbre." Enfin, le ténor suédois Martin Vanberg est un Saint Jean solaire, sensible et charmant, à voix belle et homogène. Komplettiert wurde der gute Eindruck durch ein fünfköpfiges, ausgewogenes Solistenensemble. Hier ist besonders der Tenor Martin Vanberg zu nennen, der mit heller und klarer Stimme das Evangelium vortrug." "i denne, for en opera usædvanlige og vanskelige, rolle gør Martin Vanberg stort og knivskarpt indtryk, godt understøttet af en smidig og skøntklingende tenor, hvad enten han bevegede sig rundt i ulasteligt jakkesæt eller forbigående blev klædt af til skindet." Höjdpunkten kom i kantatens tenoraria med körkoral, där arians oro ställs mot koralens lugn samtidigt som arians tonrankor kan uppfattas som utsmyckningar av koralen. Tenoren Martin Vanberg underströk denna dubbelhet genom att göra sina snabba toner koral­mässigt regelbundna, inte nervöst flackande. Här fanns det stillhet mitt i ängslan. "Den velsyngende psykoterapeut, den flotte, svenske tenor Martin Vanberg glider i ét med rollen som den tjekkede terapeut... Hans stemme både trygler og håner, afdækker og glatter ud. Her er en terapeut, der kan sin Ødipus!" "Martin Vanberg possiede voce di squisita dolcezza e morbidezza che ha riversato pienamente nello stupendo e intimo Benedictus." "Martin Vanberg ha voce particolarmente a suo agio nel registro acuto e correttamente educata, piacevole nonostante il timbro leggermente acidulo e lascia soddisfatto il fruitore come si ha occasione di sentire nel “Domine Deus” e nel “Benedictus"
"Jag imponeras av den känslomässiga laddningen i kärleken till konsten och hur väl ensemblen lyckas förmedla den i Stina Anckers regi. Inte minst Martin Vanbergs Dekormålaren, sensuellt förälskad i sina penslar och sin canvas." "I get impressed by the emotional outburst for the love of the art and of how well the ensemble manages to deliver it. Especially Martin Vanberg's painter, sensually in love with his brushes and his canvas"
"Ce dernier est magnifiquement défendu par le ténor Martin Vanberg : voix bien charpentée, flatteuse, à l'étendue stupéfiante." "Le rôle-titre est confié à la ligne claire et racée, paisiblement vocalisante, passant avec aplomb de la fougue testostéronée à l’affliction, du solaire Martin Vanberg. "The young Swedish tenor Martin Vanberg sang stylishly as Jephtha. His ‘Waft her, angels’ attained a gracious lyricism." "One voice was outstanding and fully intriguing: the ethereal translucent, mystifying tenor voice of Martin Vanberg"
"Especially the tenor Martin Vanberg...managed to express an authencity in the despair of Jephta and he showed singing qualities which was greatly impressive. "Martin Vanberg was brilliant in the recitatives"
"The Evangelist has the most demanding and difficult task. Vanberg fulfilled our expectations with a typical Evangelist voice." 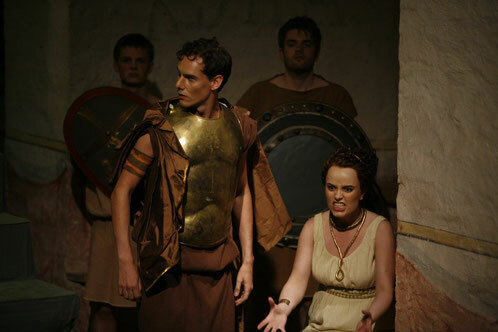 "It is difficult to pick any of the Athenians, but Martin Vanberg’s Lysander had a particularly expressive voice even when he was singing quietly." "Ténor clair fort à son aise dans la musique de Monteverdi, le Suédois Martin Vanberg livre ensuite un Lucano efficace, et une Nutrice d'Ottavia aussi remarquablement chantée que drôle (sorte de gretchen-girafe qui ne dédaigne pas la chose)." "...Avec ces trois chanteurs, les disciples de Sénèque bénéficient d'une distribution idéalement équilibrée." "In vocal content, the performance gained more than most from its soloists. Carrying much of the workload, Swedish tenor Martin Vanberg proved an ideal Evangelist, showing few signs of strain in upper reaches and gifted with a transparent timbre that borders on male alto territory. He also took on the work's two active and challenging tenor solos with no apparent signs of stress; as clear of voice in the last recitative as in the first." "Vanberg leads us through the piece with a clear baroque tenor which is straightforward and unpretentious. It is well done, with a youthfull seriousness and empathy that I believe in"
• "I Natt! I Natt! 2", Malmö Opera, Ystad Theatre etc. "Martin Vanberg as Jonathan and ... gives strong performances." "Vocally convincing is mainly ... and Martin Vanberg. He, with the most exquisite baroque tenor that, with absolute facility, ornaments his way even in virtuous numbers like the first act hit-song "Birth and fortune I despise"." "I mourn Martin Vanbergs lanky Jonathan when he dies."